Please refer to our stock # 384 when inquiring. Outstanding rare French poupee was presented by the impressive Maison Simonne ...... Au Passage Delorme / Rue de Rivoli . 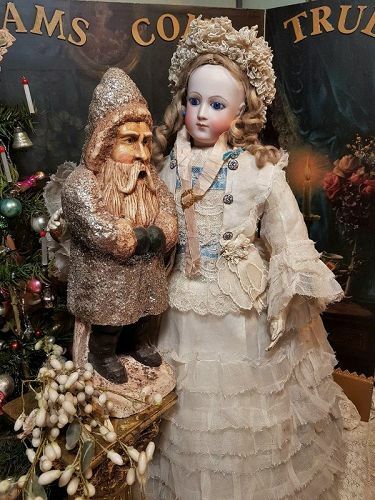 Maison Simonne belongs to the special and luxury Doll boutique in Paris and the most Doll´s and automaton which was sold there was made by Jumeau .... Blampoix and Vichy as well. From Maison Simonne ... circa 1865 / 68 ..... very rare Mademoiselle whose unusual face expression and pale bisque dramatized by her brilliant blue eyes , original wig and fantastic Muslin gown. Rare 19,5 " ( 50 cm ) fashion doll with pale bisque swivel head on kid-edged bisque shoulder plate of best quality . She has almond shaped blue glass enamel eyes with dark eyeliner and fine painted long lashes . Feathered brows and closed mouth with fine outlined lips . Pierced flat ears and gorgeous original blonde curled mohair wig over cork pate . Layaway are always welcome , please ask about ! !